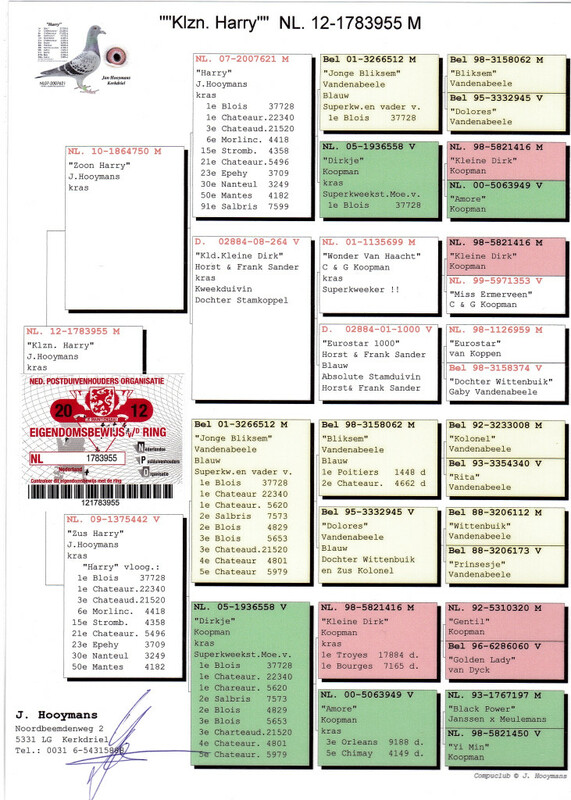 NL12-1783955, INBRED HARRY, bred by Jan Hooymans from NL10-1864750, SON “HARRY”, from NL07-2007621, HARRY, 1st Blois 37.728 BIRDS, 1st Chateauroux 24.340 birds, 3rd Chateauroux 21.520 birds of Jan Hooymans, when paired to his best sister, NL06-1266956, LAATJE “56”, 2nd Salbris 7.599 birds, 12th Bourges 4.347 birds, both bred from the SUPERPAIR, B01-3266512, JONGE BLIKSEM and NL05-1936558, DIRKJE……., when paired to DV08-02884-264, daughter superkoppel NL01-1135699, WONDER VAN HAACHT, son KLEINE DIRK and Miss Ermerveen, with DV01-02884-1000, EUROSTAR 1000, the foundation hen for H.& F. Sander from EUROSTAR and DAUGHTER WITTENBUIK. 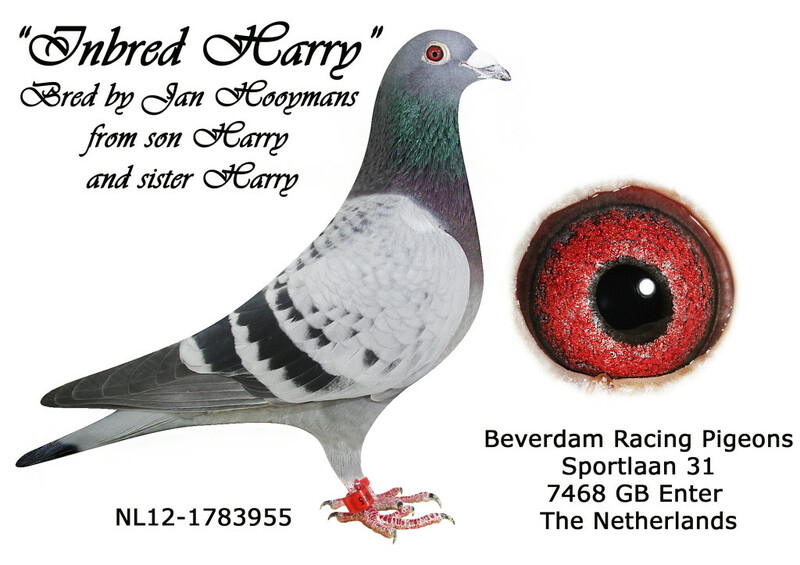 Dam of Inbred Harry is NL09-1375442, SISTER HARRY, full sister of the star of the loft of Jan Hooymans, famous HARRY, HARRY, 1st Blois 37.728 BIRDS, 1st Chateauroux 24.340 birds, 3rd Chateauroux 21.520 birds of Jan Hooymans, when paired to his best sister, NL06-1266956, LAATJE “56”, 2nd Salbris 7.599 birds, 12th Bourges 4.347 birds, both bred from the SUPERPAIR, B01-3266512, JONGE BLIKSEM , son BLIKSEM and Dolores paired with NL05-1936558, DIRKJE, daughter NL98-5821416, KLEINE DIRK and NL00-5063949, AMORE, the superpair for Gerard Koopman. Inbred Harry in first year of breeding already gave 1st prize winner!